Whether you’re remodeling the whole house or freshening up only a few rooms, new floor coverings can revive spaces that have seen better days. Usually, more expensive carpeting retains its color and pile for a longer period of time than cheaper offerings. Composition. Remember that carpeting is usually made of nylon, Olefin, polyester or acrylic fibers adhered to a mesh backing. If yours must withstand the demands of children, pets, and frequent family gatherings, nylon can’t be beat for durability. It’s know for colorfastness, stain-resistance, and a high level of resilience against everyday wear and tear. Density. Generally, the denser the pile yarn the longer the carpeting will keep its tight, thick appearance. With carpeting that has a loose pile, the fibers are likely to separate and relax over time, causing the floor covering to lose its plushness and color vibrancy. Cleaning. 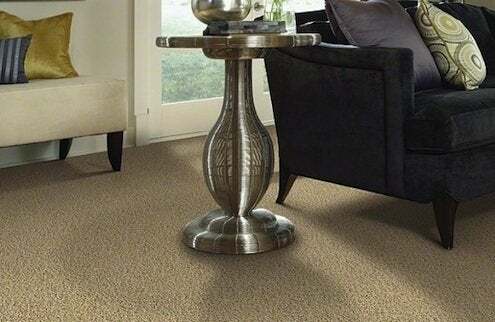 If you plan to install carpeting in a high-traffic room, save yourself headaches by choosing an easy-to-clean product. Since it stands up to soil and stains, nylon is a popular choice, though in bathrooms and other similarly moist areas of the home, mildew-resistant Olefin may be the superior choice. Healthy Home. Interested in creating an eco-friendly environment at home? Be wary of the fact that traditional carpeting is known to off-gas a mix of latex, polypropylene, polyurethane, polyvinyl chloride and other chemicals. Opt instead for carpeting composed of non-toxic, natural materials, such as wool, cotton, or even seagrass.